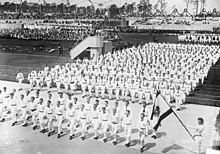 ↑ Sports Reference.com (SR/Olympics), "1920 Antwerpen Summer Games"; retrieved 2012-7-25. ↑ "Olympic Games in 1916 Not Likely," Harvard Crimson (US). December 10, 1914; retrieved 2012-7-25. ↑ "Berlin Stadium Is Begun. Olympic Meeting Place to be at the Grunewald Race Course," New York Times. July 23, 1912; excerpt, "Work has already been begun on the Olympic Stadium for 1916"; retrieved 2012-7-25. ↑ "60,000 Dedicate Berlin Stadium. Ten Thousand Pigeons Carry Address on Athletics and Patriotism to All Parts of Empire," New York Times. June 9, 1913; excerpt, "In the presence the Kaiser and his sons and a great concourse of notables, the Berlin Stadium was opened today"; retrieved 2012-7-25. ↑ Zarnowski, C. Frank. "A Look at Olympic Costs," Citius, Altius, Fortius (US). Summer 1992, Vol. 1, Issue 1, p. 20 [5 of 17 PDF]; retrieved 2012-7-25. This page was last changed on 1 August 2018, at 13:24.